Our laboratory is interested in the mechanisms by which the second messenger cAMP regulates cellular gene expression in response to environmental cues (Mayr and Montminy, 2001). Recent work has focused in particular on the role of the cAMP pathway in mediating effects of pancreatic glucagon on induction of the gluconeogenic program in liver during fasting. Elevations in pancreatic glucagon trigger gluconeogenic gene expression in part through the PKA mediated phosphorylation of the transcription factor CREB at Ser133 (Gonzalez and Montminy, 1989, Gonzalez et al., 1989); and this modification in turn promotes an association with the histone acetylase coactivator paralogs P300 and CBP (Arias et al., 1994). Glucagon also stimulates the gluconeogenic program through the de-phosphorylation of the latent CREB coactivator TORC2, which translocates to the nucleus and binds to CREB on relevant target genes (Koo et al., 2005). Hepatic over-expression of TORC2 increases fasting glucose production, while depletion of TORC2 promotes hypoglycemia. 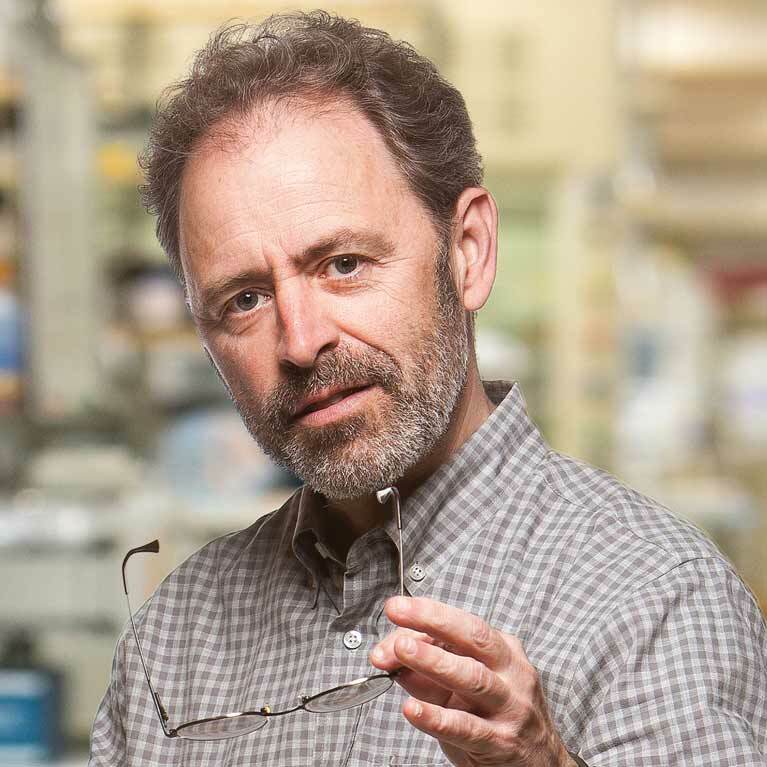 TORC2 activity is constitutively activated in diabetes, where it contributes to the attendant hyperglycemia (Dentin et al., 2007). 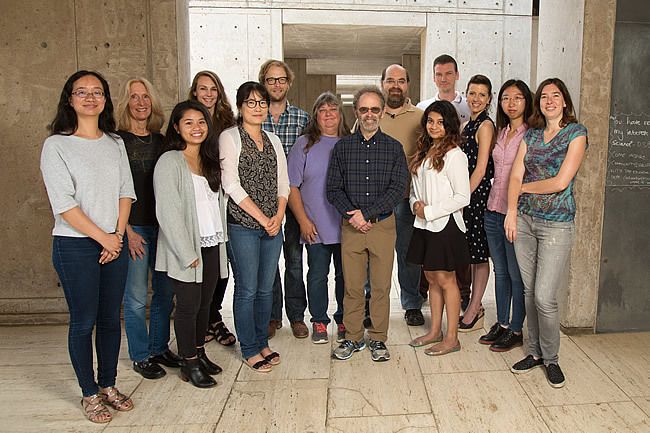 Current studies are focused on the role of the TORC family (TORC1, TORC2, TORC3) in regulating metabolic programs through CREB and perhaps other transcription factors in insulin-sensitive tissues. We have used adenoviral delivery approaches to dissect the CREB:TORC2 pathway in liver using over-expression and RNAi mediated depletion; and these studies will be complemented using TORC knockout mice. A parallel effort is directed towards the Salt Inducible Kinases (SIKs) which phosphorylate and inhibit TORC activity under basal conditions. Recent studies in Drosophila point to a conserved role for TORCs in metabolic regulation (Wang et al., 2008). P-element mediated excision of the single TORC homolog disrupted CREB target gene expression and promoted starvation sensitivity in flies. Current efforts are focused on identifying novel modulators of TORC with a variety of genetic screens. Live imaging studies with a hepatic CRE-reporter have facilitated the analysis CREB and TORC activities in relation to fasting and feeding (Dentin et al., 2007, Dentin et al., 2008). Expanding this approach to other insulin-sensitive tissues will be important in understanding mechanisms of metabolic control through this pathway. Taken together, studies of the CREB:TORC pathway in insulin sensitive tissues should provide mechanistic insight in the context of a physiologically relevant system. Screaton, R. A. et al. 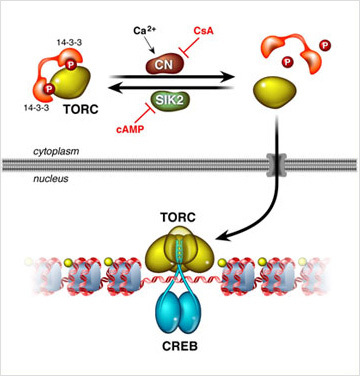 The CREB coactivator TORC2 functions as a calcium- and cAMP-sensitive coincidence detector. Cell 119, 61-74 (2004). Wang, B. et al. The Insulin-Regulated CREB Coactivator TORC Promotes Stress Resistance in Drosophila. Cell Metabolism, 7, 434-444 (2008). Altarejos, J.Y. et al. The Creb1 coactivator Crtc 1 is required for energy balance and Fertility. Nature Medicine, 10, 1112-1117 (2008). Song, Y. et al. The CREB coactivator CRTC3 links catecholamine signaling to energy balance. Nature, in press (2010).